SANDY Crombie looked haggard, his face tired and drawn as he prepared for his last meeting on Wednesday. It was the worst day of his less than three months as chief executive of Standard Life as he announced the business is to end its 79-year-old mutual status. Crombie will know that such treatment comes with the territory. After all, he learned the hard way two months ago when John McFall MP, the convener of the Treasury select committee, compared him to the infamous former Iraqi information minister “Comical Ali”. The harshest questioning at the meeting will doubtless revolve around the spectacular volte face unveiled by Standard Life last week and the small matter of executive pay. Not only did Europe’s largest mutual insurer say it would go ahead with the scrapping of its once cherished mutual status – something it had earlier fought tooth and nail to defend – some time after 2006; it also made an implicit admission of failure in the UK life and pensions market, saying it now needs to spruce itself up to make itself more attractive to future stock market investors. This will include axing more than 1,000 of its 14,000 global workforce, 880 of them in Edinburgh. The company has huge volumes of low-margin and unprofitable business on its books, particularly in the pensions area, which is why such radical surgery is needed now. Overall, Crombie told the Sunday Herald, a total of 1600 jobs will have to go from its core life and pensions business this financial year – including no replacements for departing staff since November 15, 2003 – with a view to making cost savings of 20%. The life assurer also said it could not rule out compulsory redundancies and that it would close its final salary pension scheme to new recruits from November. Staff – who for years have been encouraged to support the mutual line and to view Standard Life as a benevolent employer – have good reason to feel badly let down. All this came from a group whose recently departed chief executive Iain Lumsden received a salary and bonus of nearly £1 million last year and where a clutch of top executives received a collective £2.6m injection into their pension pots, over and above their already generous 2003 remuneration packages. The surge in executive pay at the life assurer came despite the drip, drip, drip of cuts in policyholder bonuses (four in two years) as well as shortfalls on most of the company’s endowment-linked mortgages. 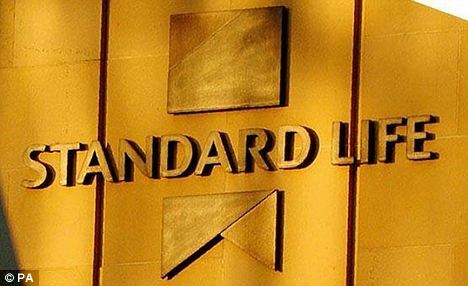 Standard Life said it was embarking on a review of its ownership status after a well documented spat with the Financial Services Authority over the “realistic reporting regime” in January. The ultimate destination of that review – conducted by Standard Life’s board together with consultants McKinsey, investment banks UBS and Lazards, law firm Clifford Chance and actuarial consultants Watson Wyatt – was meant to be uncertain and the findings were not expected until June. But last Wednesday, interim findings were made public much earlier than expected, in what some perceived as an attempt to get all the bad news out at once. Aside from the job losses and the decision to convert to a plc, Standard Life said the “most likely outcome” for its business structure is that it will “retain and develop” its major associated companies – which include Standard Life Bank, Standard Life Healthcare and Standard Life Investments – together with the bulk of its international businesses. But plans to open for business in France have been scrapped. Speaking to the Sunday Herald last week, Crombie admitted Standard Life’s remuneration and reward structure is partly to blame for its predicament. He said this is too skewed towards motivating executives and staff to sell financial products at all costs – irrespective of whether or not the resultant business would be profitable. In as many words, Crombie was conceding that the pursuit of market share at all costs – the strategy under predecessors Scott Bell and Lumsden – was to tilt at windmills. Crombie, who took over as chief executive from Lumsden in January, and who has sought to disassociate himself from the mistakes of the past (even though he joined the company in 1966 and its board in January 2000) said: “We had an infrastructure for a business that had all those higher-charge products and, as you know, we led a movement to introduce lower charges across the whole product range. “We tried to grow the business to fit that infrastructure but that growth [turned out] not to be sufficiently profitable. We tried to address the issue of these costs by growing the business. Now, we’ve been required to meet our unit costs by cutting the infrastructure. Sloan’s analysis is much harsher: “They rushed headlong to take the hot money from Equitable Life from 2000 on. They previously said they weren’t going to do single premium bonds – but then appeared to throw caution to the wind, taking in hundreds of millions off Equitable Life at the top of the market. But they failed to apply the ‘market value adjuster’ to that business. Now Standard Life says it will reposition its UK life and pensions business to achieve profitable growth – meaning the group will seek to exit from market segments where margins are thin and put more emphasis on more profitable segments. Critics including Sloan wonder why this wasn’t done before. David Nisbet, an analyst at Merrill Lynch, said: “I was surprised that Standard Life felt it necessary to take such radical steps to improve the profitability of its UK business. “My impression is that Standard Life’s expense ratio compares reasonably well with those of most major competitors, although the recent slowdown in new business will have exerted some upward pressure on expense ratios. Also in terms of its business mix, Standard Life’s orientation towards pensions will have had a disproportionate effect [on its expense ratio]. It has been estimated that Standard Life’s decision to reduce the charges on all existing pension policies (to match Stakeholder) cost it a loss of revenues of at least £750m. Nisbet believes the insurer will be seeking to reduce its dependence on pensions and step up its presence in areas such as term assurance and investments. He suggested Standard Life will refocus on higher margin market segments including defined contribution pension schemes, investments (it launches an “open architecture platform” for a selection of third-party mutual funds later this month), term assurance, income drawdown and Sipps. There is also likely to be an increase in charges and a rebasing of commission structures. Standard Life last week also said it would widen its distribution network by developing relationships with other intermediaries and business partners, at the same time as retaining its traditional independent financial adviser channel. Commerzbank analyst Roman Cizdyn believes it may forge a bancassurance link with HSBC, the only leading bank without one. Insurers such as Legal & General and Aviva already have tie-ups with, respectively, Barclays and Royal Bank of Scotland. But Crombie suggested “single tie” deals are ancient history. He said: “We’ll not be going back to single tie, because in that environment the producer takes responsibility for the sale – and we’re not going there. Crombie highlighted the wider problem of consumer mistrust of the industry, and even had a dig at the media for exaggerating the problems of certain financial products. “People have less trust in providers of long-term financial services than they had. Unfortunately they are often driven to that view by commentary which is often not necessarily good analysis. Crombie is adamant that the launch of subsidiaries such as Standard Life Bank and Standard Life Healthcare does not lie behind the group’s current predicament. “The subsidiaries are self-sufficient in capital. The problem we are addressing through demutualisation is that the with-profits business is shrinking as a proportion of the whole life and pensions business. “Last month it was 13% of new business. Four years ago it represented one half of the total business. Now it’s one third and it will soon be one quarter. But why is it going to take two whole years before Scottish members will get the chance to vote on whether they wish Standard to convert to plc status? Crombie suggested one reason for the delay is that the company will be worth more by that time. A combination of the current sprucing up of the business and a rising market might just make the valuation more promising once it eventually floats. All current Standard Life policyholders are set to get at least some shares, with an additional tranche of shares being placed with institutional buyers. Windfalls are currently expected to average in the £1500-£2000 range, considerably lower than might have been achieved had the company floated following Fred Woollard’s demutualisation challenge in 2000. The analysts’ prediction is based on a £4 billion estimate of the company’s market value. That may well be conservative and compares to a current market value of £12.1bn for Aviva (formerly CGNU), £8.9bn for Prudential and £6bn for Legal & General. But what of the danger that Standard Life will be taken over by a rival financial-services player before it gets to market – as happened when Prudential snapped up Scottish Amicable in 1997? But Crombie told the Sunday Herald the board would consider an approach from a trade buyer should one make itself known. The once-proud mutual has effectively hung out a for-sale sign.